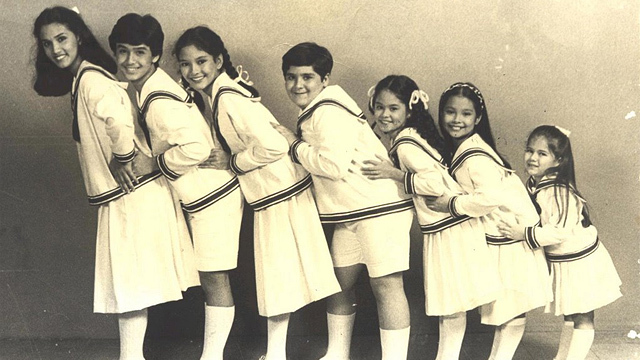 A Broadway hit, the journey of Lola Basyang's grandson, and more. (SPOT.ph) We're still catching our breath from laughing so much while watching Monty Python's Spamalot (which runs until August 12), but there's already a new lineup of theater shows that's bound to give you all sorts of emotions. There's a retelling of Shakespeare's famous tragedies, an unearthing of classic Filipino pieces, and a few new stories to see. Get your tickets before they run out! 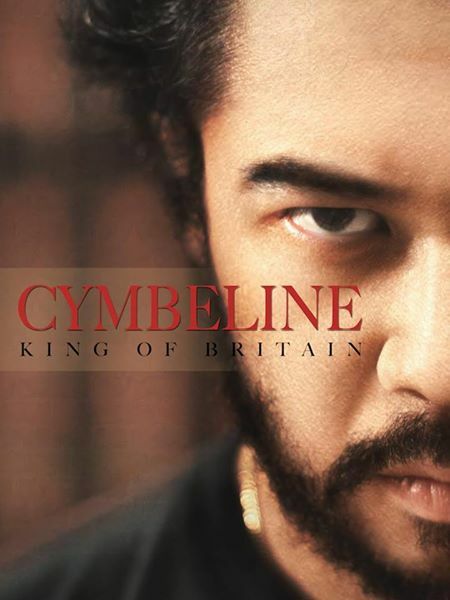 After a 21st Century treatment of the immortal love story Romeo and Juliet, Manila Shakespeare Company once again breathes new life into a Shakespearian classic—Cymbeline, King of Britain. This underappreciated romance deals with themes of innocence, jealousy, and passion. Gabby Padilla as the determined princess Imogen, Rico Duran del Rosario as her beloved Posthumus, and Gio Gahol as the seducer Iachimo star in this production. It is directed by Nicanor P. Campos. Cymbeline runs from August 4 to 20 at Pineapple Lab, 6071 Palma Street, Makati City. Tickets, priced at P500, are available through 0939-596-9250 or mnlshakesco@gmail.com. College of St. Benilde Performing Arts senior Mara Aboitiz-Francisco directs a production that focuses on the key elements of dance: body shapes, movement, space, time, and energy. Joining her in this "unboxing" of creative juices are fellow dance students Olivia Bugayong, Ina Media, Jireh Cariaso, and Kul Dela Torre, and professional lighting designer Katsch Catoy. 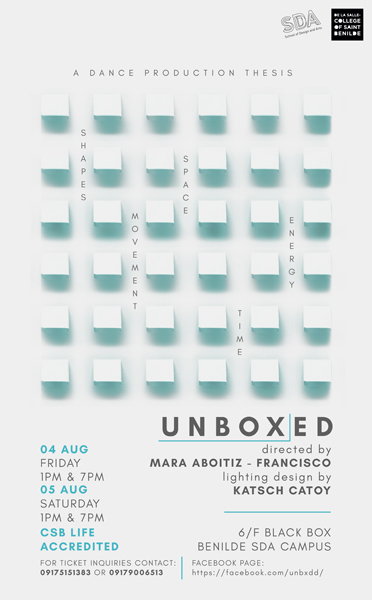 Unboxed runs from August 4 to 5 at Black Box, College of St. Benilde - School of Design, Malate, Manila. Tickets, priced at P150, are available through 0917-515-1383 or 0917-900-6513. For its August production, De La Salle University's Harlequin Theater Guild centers on one-act plays that can teach its college-age audience a thing or two. The first is Elmer L. Gatchalian's Ambon ng Kristal which won in the Carlos Palanca Memorial Awards in 1994 and was on tour until 1998. The second is another Palanca-winning play by Jun Robles Lana titled June at Johnny, which tackles teenage pregnancy and young love. 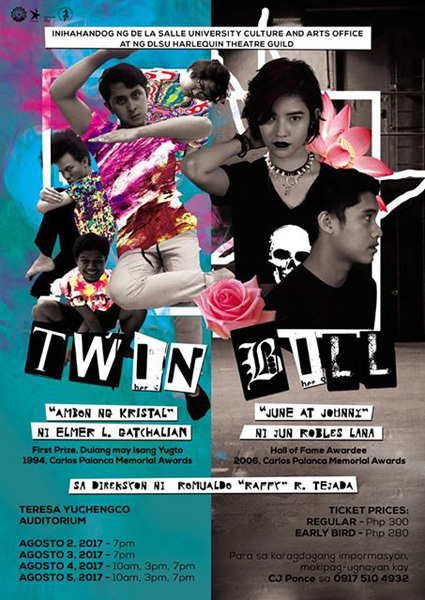 Twin Bill runs from August 2 to 5 at the Teresa Yuchengco Auditorium, 7/F Don Enrique T. Yuchengco Hall, De La Salle University, Malate, Manila. Tickets, priced at P300, are available through 0917-510-4932. The nieces and nephews might want to see this show by kids and for kids. 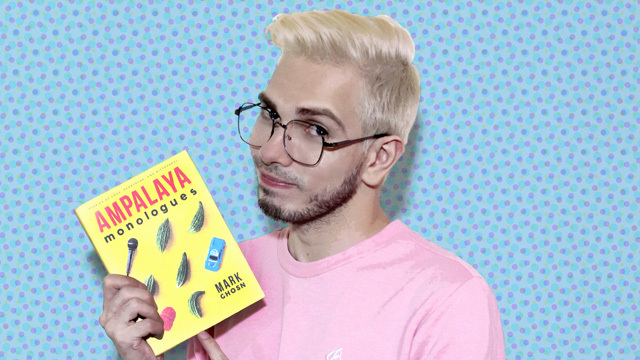 Kids Acts Philippines’ Cinderella follows the original manuscript of Charles Perrault's fairy tale that we all love, but with localized script, lyrics, and music. Be prepared to be amazed as the Fairy Godmother magically turns Cinderella into a princess with a beautiful pair of glass shoes. 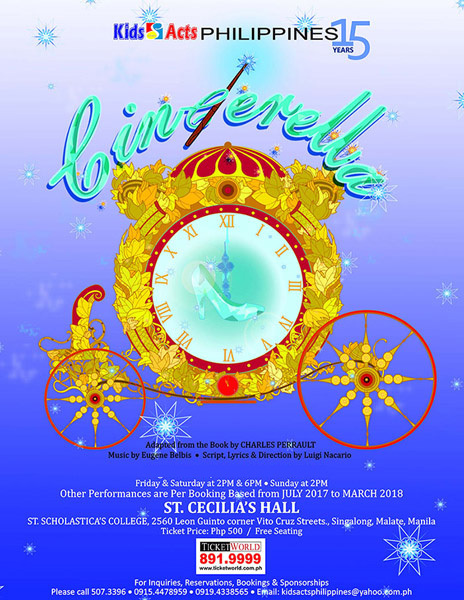 Cinderella runs from August 4 to 6 at St. Cecilia's Hall, St. Scholastica's College, Leon Guinto Street corner Vito Cruz Street, Malate, Manila. Tickets, priced at P500, are available through Ticketworld. Juan Luna, known for his large painting "Spoliarium," was an award-winning Filipino painter, sculptor, and political activist in the late 19th Century. This musical by Vince Tañada is a tribute to Luna's life of heroism and artistry through songs and dance. "Feel the horror, retribution, and sacrifice of the most underrated Philippine hero," the director teases about its world premiere. 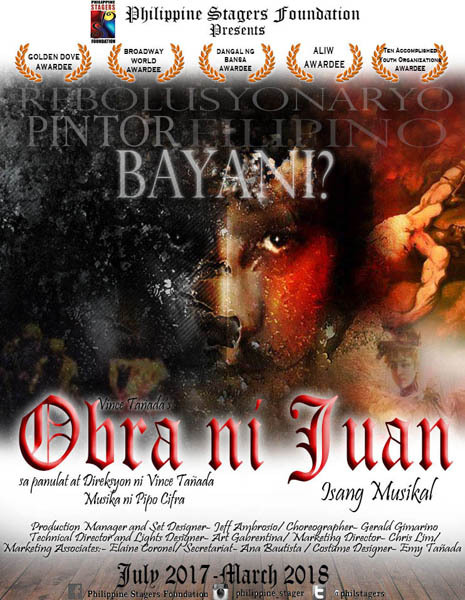 Obra ni Juan is on August 5, 5 p.m. at SM North EDSA Cinema 9, Quezon City. Tickets, priced at P300, are available through Ticketworld. 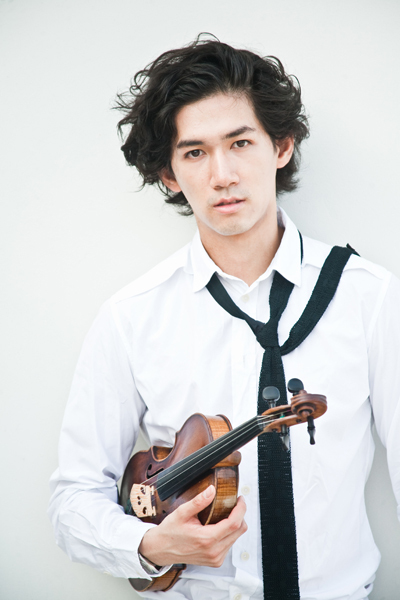 Guest conductor Darrell Ang from Singapore and German-Indonesian violinist Iskandar Widjaja join the Philippines' renowned 55-piece orchestra for back-to-back performances this August. The repertoire includes Antonin Dvorak's “Symphony No. 8,” Edouard Lalo’s “Symphonie Espagnole,” and a never-before-heard piece by Filipino composer Nilo Alcala. Guest Experience: Darrell Ang and Iskandar Widjaja is on August 5, 8 p.m. at Henry Lee Irwin Theater, Ateneo de Manila University, Quezon City and on August 6, 6 p.m. at Power Mac Center Spotlight, 2/F Circuit Lane, Circuit Makati, Makati City. Tickets, priced from P350 to P1,400, are available through Ticketworld. West Side Story is often dubbed as the Romeo and Juliet of 1950s New York. It follows the forbidden relationship between Maria (Jenna Burns) and Tony (Kevin Hack) who fall in love at first sight during a party attended by two rival groups called the Sharks and the Jets. To make matters worse, Maria is the sister of Bernardo (Waldemar Quinones-Villanueva), leader of the Sharks, while Tony is the best friend of Riff (Lance Hayes), leader of the Jets. 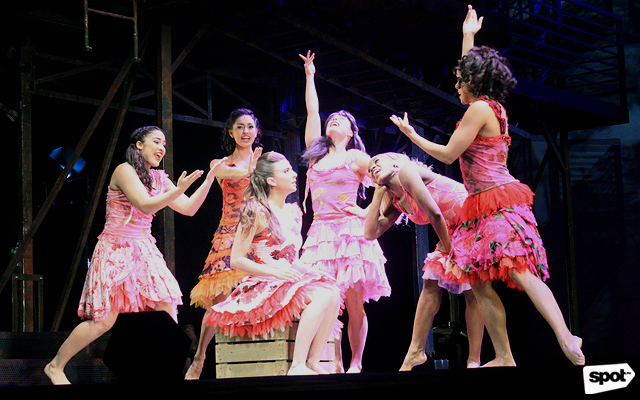 West Side Story runs from August 10 to 27 at The Theatre at Solaire, Solaire Resort and Casino, 1 Aseana Avenue, Tambo, Parañaque City. Tickets, priced from P1,500 to P7,000, are available through Ticketworld. Repertory Philippines brings back Beauty and the Beast to celebrate 25 years of its Theater for Young Audiences. Written by Peter del Valle and John Ahearn with music by Michael Valenti and lyrics by Elsa Rael, this musical follows a story we all know and love. Cursed by a wicked enchantress, the prince turns into a hideous beast and will only be freed when he learns to love and be loved in return. On the other side of the fairy tale is a beautiful village girl who enters a mysterious castle and gets to know the cold-hearted Beast. It is directed by Joy Virata. Beauty and the Beast runs from August 12 to October 22 at Onstage Theater, Greenbelt 1, Makati City. Tickets, priced from P450 to P650, are available through Ticketworld. PETA's newest children's play unearths the forgotten stories of Saysay Lupalop through Popoy, the young descendant of Lola Basyang. He embarks on a magical journey to save the world of stories from the curse of the evil Papaw Halimaw. Significant more than ever is its take on the importance of storytelling and power of imagination in shaping children. 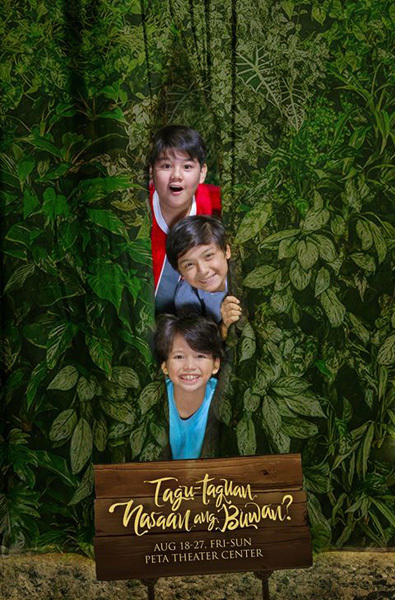 Tagu-taguan Nasaan ang Buwan? runs from August 18 to 27 at the PETA Theater Center, Sunnyside Drive, New Manila, Quezon City. Tickets, priced from P600 to P800, are available through 0917-539-1112. 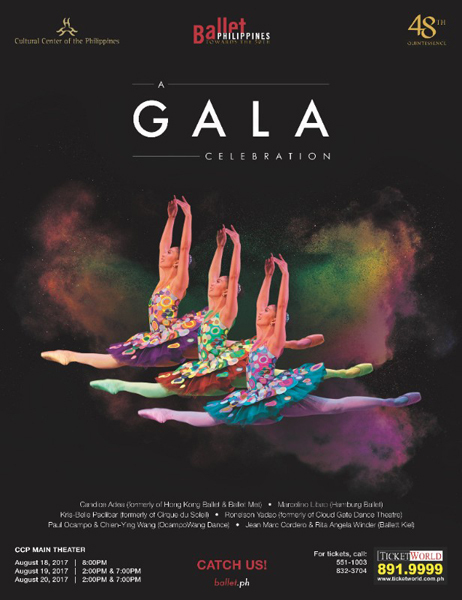 The country's flagship professional classical and contemporary dance company opens its 48th Season, titled Quintessence, with a big gala performance featuring Filipino stars from various international dance groups. It also marks the return of Alice Reyes, National Artist for Dance, as the Ballet Philippines' Artistic Director. Featured works include Agnes Locsin's "Salome," Bam Damian’s "Minamahal, Sinasamba," and more. 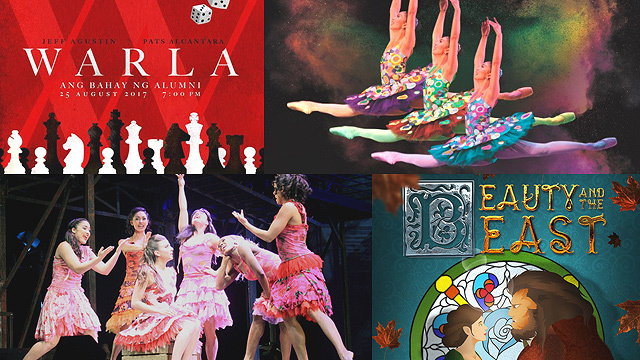 A Gala Celebration runs from August 18 to 20 at the CCP Main Theater, Cultural Center of the Philippines, Roxas Boulevard, Pasay City. Tickets, priced from P500 to 1,500, are available through Ticketworld. 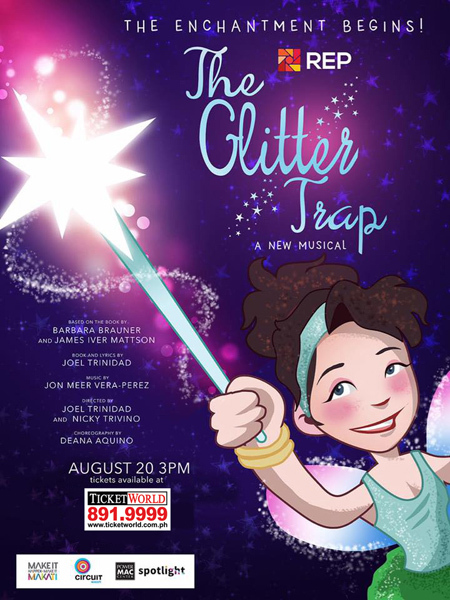 Repertory Philippines brings back The Glitter Trap this August as a fundraising project to stage a special free rerun for the kids and families of selected barangays in Makati. 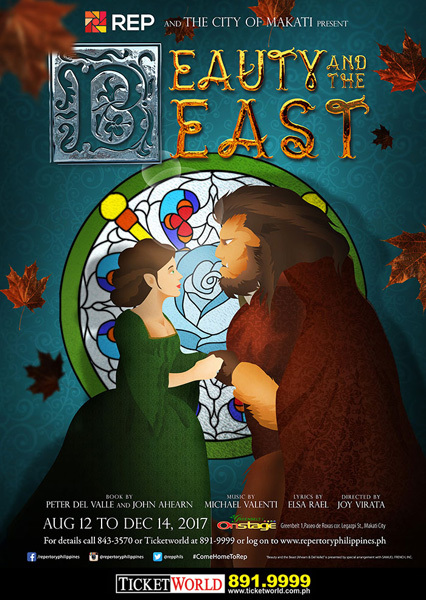 The musical by Joel Trinidad and Jon Meer Vera Perez is based on the young adult Disney novel of the same title by Barbara Brauner and James Iver Mattson. It follows the story of Lacey, a young girl who accidentally injures a Fairy Godmother and eventually takes on the job herself. The Glitter Trap is on August 20, 3 p.m. at Power Mac Center Spotlight, 2/F Circuit Lane, Circuit Makati, Makati City. Tickets, priced at P500, are available through Ticketworld. UP Sirkulo ng Kabataang Artista uses a chess game to show the art of war. The pieces on opposite ends count their losses, prepare for another attack, and defend themselves from invasion, not necessarily in that order. Although just a game (and a play), it touches on the "game" that is Philippine politics. 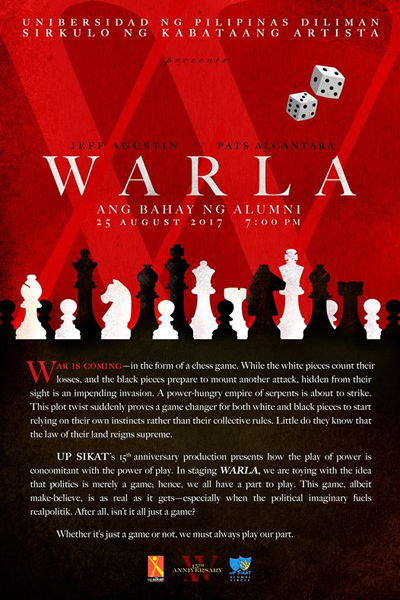 Warla is on August 25, 7 p.m. at UP Bahay ng Alumni, University of the Philippines - Diliman, Quezon City. Tickets, priced from P40 to P120, are available through 0908-958-7688. Ballet Manila presents a unique rendition of this classic 15th Century Filipino epic through elegant choreography by Gerardo Francisco for the dance company's 22nd season opener. Diwa de Leon's music as well as Gia Macuja Atchison’s rendition of the voice of Ibong Adarna complement this visual feast. Ibong Adarna runs from August 26 to September 3 at Aliw Theater, Cultural Center of the Philippines Complex, Vicente Sotto Street, Pasay City. Tickets, priced from P500 to P1,500, are available through Ticketworld.